It's time for yet another colour post! Deadly poisons and useful drugs can cause regions of your body to take on a different colour from normal. In addition to being super weird, these unexpected colours often provide a valuable clue for doctors looking to make a diagnosis. Let's look at a couple of examples. Long-term exposure to mercury, a toxic metal once widely used as a treatment for syphilis, can cause your hands and feet to swell, peel, feel like they are on fire, and turn a dark shade of pink. This condition, known as acrodynia or pink disease, often is associated with damage to the kidneys, brain, and nerves throughout the body. Sadly, it’s usually seen in little kids. Somewhere along the way, drug makers decided it was a good idea to add a form of mercury called calomel (which, incidentally, is a tremendously effective laxative) to teething powders. These medicines are marketed to parents looking to relieve the pain babies go through as their teeth start coming in. Tragically, buyers can end up with pink-tipped offspring afflicted with organ damage. While mercury-containing teething powders are now outlawed in Europe and North America, they still may be sold in other parts of the world. Another way kids have been turned pink is by playing with broken old thermometers or blood pressure readers (sphygmomanometers) containing liquid elemental mercury. The pink colour usually goes away after the affected person is given a chelating agent, a drug capable of capturing mercury and helping your body to get rid of it. A colourful side effect of several drugs used to kill bacteria is something called red man syndrome, which typically involves your head, neck, and upper torso turning bright red. Essentially the drugs trigger a skin-based immune response after being introduced into the bloodstream. The dermis layer of skin is dotted with mast cells, which are filled to the brim with histamine. If you bother a mast cell (say, by exposing it to an antibiotic), it dumps its load of histamine and you get what allergy meds are designed to treat: swelling, itching, and redness. Red man syndrome is particularly closely associated with the antibiotic vancomycin, which was rushed into production following its discovery in 1953 due to concerns at the time about the rise of penicillin resistance. Early batches of vancomycin were pretty rough and so the syndrome was initially blamed on the other junk contaminating preparations of the antibiotic. People still turned red even after things were cleaned up, and eventually someone figured out that pushing certain antibiotics into a person’s bloodstream too quickly was a great way to annoy mast cells. Antibiotic-induced redness usually clears up after administering an antihistamine drug. In addition to their monetary value, gold and silver each make an appearance in medicine. Drugs containing these metals, if taken over long periods of time, can cause your skin and the white part of your eyes to take on a grayish blue or purple colour. This is due to metal granules becoming deposited in these parts of the body. When caused by gold, the colour change is known as chrysiasis (chrysos is old Greek for gold). 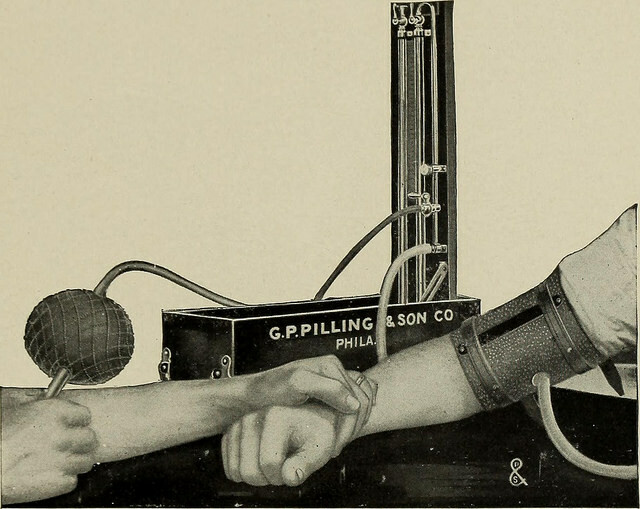 For much of the 20th century, gold was used to treat rheumatoid arthritis, either as a pill or by directly injecting gold salts into affected joints. A particularly bizarre case of chrysiasis involved a chemist who ended up with a bunch of gold embedded in their eyes after a gold compound they were working with exploded by accident. When caused by silver, turning blue or purple is known as argyria (argyros is old Greek for silver). This metal can be ingested in a colloidal form (very small chunks suspended in a liquid), which is mistakenly thought by some to have a beneficial health effect. 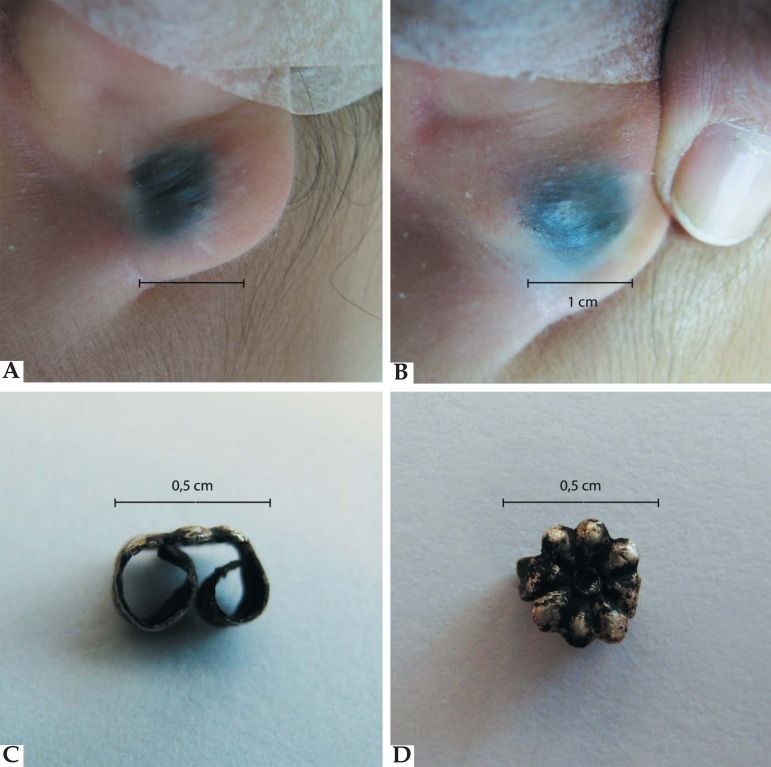 Localized forms of argyria and chrysiasis can also occur where objects such as earrings or fancy acupuncture needles become embedded in the skin. Many of the drugs used to kill cancer cells can darken parts of your tongue, skin, and/or nails. The cause of this hyperpigmentation isn’t always clear. In some cases it’s thought to be due to the local accumulation of melanin, a group of dark pigments that normally contribute to the colour of skin, hair, and eyes. The drugs may be able to trick cells into making more melanin than usual or cause melanin-making cells (melanocytes) to reproduce more rapidly. Hyperpigmentation may also be the result of localized tissue damage where anticancer drugs, which are often highly toxic, are able to leak from blood vessels. 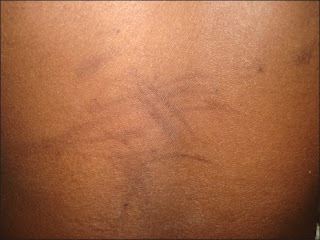 In some people treated with the drug cisplatin, black patches appear wherever pressure is applied to their skin. One person ended up with dark patches on their chest wall where the shoulder pads of their crutches were positioned. In other cases, dark patches formed over sites where incisions had been made during surgery. Cisplatin-induced hyperpigmentation appears to be permanent, although it can fade a bit with time. 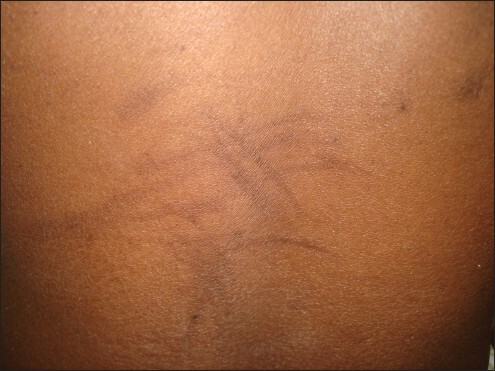 The drug bleomycin is known for causing multiple dark whip-like streaks ('scratch dermatitis') to appear on a person’s legs, ankles, and/or back. This effect is fairly common and appears to be unique to this drug. The streaks usually fade within a couple of months after the drug is discontinued. A pink goop specially engineered to coat and soothe an angry gastrointestinal tract, Pepto-Bismol owes most of its power to bismuth subsalicylate. This mysterious (its structure still isn’t entirely understood) relative of aspirin can reduce inflammation and kill harmful bacteria, helping to resolve minor gut-based ailments. Pepto-Bismol can also cause your tongue to turn black (linguinal hyperpigmentation). This is generally harmless and goes away after discontinuing the medication. However, in one extreme case of long-term Pepto-Bismol use (40-50 antacids being taken every day for more than 8 years), it caused a person’s esophagus to turn black and begin to break down. This condition (acute esophageal necrosis or black esophagus) is usually caused by drinking something caustic like drain cleaner or imbibing way too much alcohol within a short period of time. Black tongue and black esophagus occur when bismuth in the Pepto-Bismol reacts with small amounts of sulfur-containing molecules derived from recently eaten food. This produces bismuth sulfide, a black compound that isn’t very soluble in water and so tends to stick around for a while. Cohen PR. 2009. Black tongue secondary to bismuth subsalicylate: Case report and review of exogenous causes of macular lingual pigmentation. Journal of Drugs in Dermatology 8(12):1132-1135.